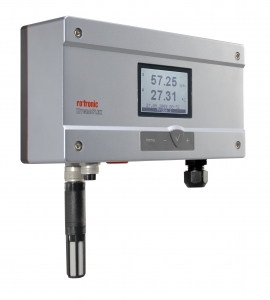 The new HF8 humidity and temperature transmitters from Rotronic are suitable for fixed-installation applications requiring high precision measurements. Based on the new advanced AirChip3000 technology, the HygroFlex8 communicates with all HygroClip2 probe types which utilize Rotronic’s time tested sensors and are used in thousands of applications worldwide. Together with the digital HygroClip2 probes, the HygroFlex8 is one of the most versatile and precise humidity and temperature measuring instruments available on the market. With a measurement accuracy of 0.8% RH and 0.1˚C, the instruments can measure humidity ranges from 0 to 100%RH and overall temperature ranges of -100 to 200˚C depending on the type of probe being used. The latest AirChip3000 technology guarantees an automatic sensor test, drift compensation and every probe is temperature compensated with over 30,000 data points to maintain the highest possible accuracy over the entire measuring range. The HF8 has two probe inputs and the optional HW4 software allows users to configure the connected HygroClip2 or 3rd party analog probes exactly to their needs. Each HF8 has four analogue outputs and four alarm relays programmable to any probe input and any probe parameter, including all psychrometric calculations such as dew point or wet-bulb. Audible and visual alarms can be activated as well. The data logging function on the HygroFlex 8 allows recording of up to 20,000 data points with date and time stamp. Users can configure the logging intervals and download, store and graph the data with the HW4 software. The optional digital outputs additionally enable connection to a network via Ethernet and Power over Ethernet (POE). If the user so wishes, the HF8 can be integrated into an RS485 network and/or make multi-drop connections in which an unlimited number of devices can be connected. All this complies with FDA CFR 21 part 11 and GAMP regulatory requirements when used with the HW4 software.